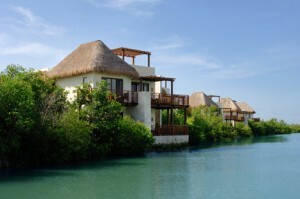 CANCUN and RIVIERA MAYA, Mexico, April 13, 2011 /PRNewswire/ — Designed for the most discerning guests seeking a truly romantic experience, THE ROYAL in Cancun and THE ROYAL Playa del Carmen don’t take luxury standing still. In a constant effort to improve guest services and amenities, while surpassing guest expectations, the luxury-gourmet, all-inclusive, all-suite, adult-only resorts continue to make enhancements to its service that inspire guest satisfaction and awe! “A true luxury experience is a continuously evolving work of art,” said Fernando Garcia, Managing Director of Real Resorts. “At THE ROYAL in Cancun and THE ROYAL Playa del Carmen we listen to our guests, examine new technologies, and continue to make refinements to our decor and our services. Our latest group of enhancements may each go individually unnoticed, but collectively they create a new level of luxury that outshines our competitors and subtly says to each guest, ‘your comfort is our priority,'” added Garcia. Some of the newest amenities and features include redecorated guest suites with comfort designed furnishings and mood enhancing color schemes. In addition there are nuances such as adjustable LED reading lamps attached to the headboard, new luxury faucets in the baths, a foot rest with the overstuffed easy chair, a posh rug accenting the brilliant marble floors, and spa style bathrobes and slippers. Regarding service, guests will find an expanded wine list with more wines and liquors incorporated into the all-inclusive experience, as well as a broader wine list, including vintage wines, champagne and spirits. In addition, the complimentary room service experience has been enhanced. Guests may still enjoy discreet delivery through the ‘Magic Box,’ or opt for a more formal room service on a well-appointed table. SPAzul, the Mayan influenced holistic spa at each of the resorts, now offer complimentary hydrotherapy in addition to a full menu of spa treatments offered at special resort pricing. All of these new additions complement the long list of amenities and services that encompass THE ROYAL experience at THE ROYAL in Cancun and THE ROYAL Playa del Carmen. In addition, each resort boasts the best location in its destination with wide expansive beaches, yet adjacent to the shops and exciting nightlife of Cancun and Playa del Carmen. Created for romance, these resorts offer ambience, gracious service, lavish amenities and sumptuous dining. THE ROYAL in Cancun is the flagship hotel for Real Resorts. 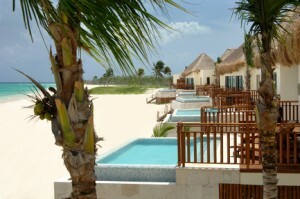 It is a luxury-gourmet, all-inclusive, all-suite resort located beachfront in the heart of Cancun’s famous Hotel Zone. It is the only hotel in Cancun with an ocean view spa (SPAzul) and is conveniently located next to its sister property, the Gran Caribe Real Cancun. All of its 288 ocean view suites have views of the Caribbean and feature large balconies with hammocks for relaxation. Guests will discover an explosion of luxury around every corner at the gourmet-luxury, all-inclusive, adult only ROYAL Playa del Carmen. This casually elegant beachfront resort is the jewel of the Rivera Maya with breathtaking views of the turquoise Caribbean. Yet its beachfront location is only steps from Playa del Carmen’s famed Fifth Avenue. Discover hip night spots, trendy cafes, colorful shops and the local color of this fishing village while experiencing THE ROYAL’s flawless hospitality. For more information and reservations contact a travel agent or visit: www.RealResorts.com, or call 1-800-760-0944. Declaring that Mexico faces a new stage in the phenomenon of insecurity, President Felipe Calderón urged all Mexicans to make a common cause against crime, in order to deal with the problem with unity and a forward-looking vision, as a genuine state policy. “Today, more than ever, the fight for security involves us all. It obliges us to look beyond differences, political calculations and any temptation to avoid responsibilities and any consideration of cost. It demands that we face the problem with unity and a vision of the future. That’s what state policy involves,” he said. At the Dialogue for Security. Evaluation and Reinforcement event, accompanied by representatives of non-governmental organizations and the business sector, the President listened to their concerns and proposals regarding the issue since, he said, the point is to be aware of the grave dangers facing our nation and to combine wills and efforts to cope with them. “I am also aware that this strategy has been questioned and that my government has been and always will be willing to review, strengthen and improve it. My government has always supported all the authorities, without distinctions, so that by combining efforts, they will be able to fulfill this responsibility,” he said. 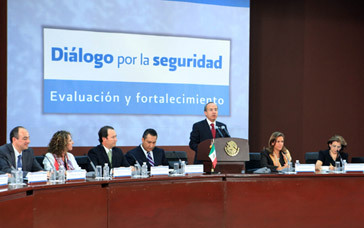 Accompanied by his wife, Margarita Zavala, Secretaries of the Interior, Francisco Blake Mora, Public Security, Genero García Luna, Attorney General, Genaro García Luna, Attorney General, Arturo Chávez Chávez and Guillermo Valdés Castellanos, Director General of the Center of Investigation and National Security (CISEN), the President said that it is essential to combine skills and efforts to strengthen and improve the National Security Strategy, because if we are divided in the face of this enemy, both society and its institutions will lose. He added that Mexico requires a security policy that will transcend this administration and at the same time, guarantee that Mexicans will be able to live in an environment of peace, laws and justice. “Increasingly frequently, the facts linked to crime show that criminals challenge everyone equally, and that they have no limits or moral scruples. They are prepared to intimidate and instill fear in society and the authorities in order to force them back in the fulfillment of their duty. They also show that without unity, Mexicans are more vulnerable. This is a time for unity among all Mexicans in an issue that affects and involves us all,” he said. He said that it is essential to begin a new stage of commitment and to demand that the authorities fulfill their duty and to follow this up to achieve this. 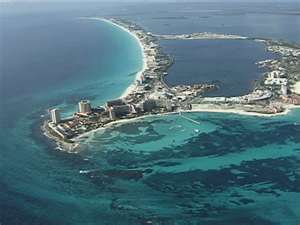 Cancun, Q. Roo (April 9th, 2011):– Cancun is ready in case the Organizing Committee considers the destination as the future host of Mexico’s largest trade show, the Tianguis Turistico. Organizers of this important tradeshow have recently decided to move its location from Acapulco. CEO of the Cancun CVB, Jesus Almaguer assured organizers that the destinations with the most experience and the ability to host Tianguis are Cancun and Riviera Maya. At a press conference where he mentioned the results after this important tradeshow, Almaguer reported that among the vast competitive advantages that Cancun has, the Cancun airport is the Latin American airport with the most international connections and the destination has a well established extensive selection of hotels and high quality tourism services and infrastructure, required to host the event. “It would be fair that many destinations in Mexico could have the opportunity to be visited,” said the Cancun CVB CEO. Moreover, he mentioned that among the destinations with the best infrastructure and airline connectivity to host Tianguis should be considered the following: Cancun and Riviera Maya, Los Cabos, Puerto Vallarta, Guadalajara, and Puebla. In this regard, he emphasized that the Ministry of Tourism will decide the future of Tianguis Turistico, based upon what is best for Mexico, because the event helps to promote and increase tourism relations for all the destinations in Mexico, not just Acapulco. Regarding the latest results of the Tianguis Turistico in Acapulco, Almaguer Salazar said that the meetings held with tour operators were very encouraging and reflected a five to ten percent increase in the number of tourists and an increase in the turnover rate of 25%. To highlight this point, is the case of Canadian airline Sunwing, who spent about 40 million dollars at hotels in Cancun during 2009-2010, a figure that has already risen about 22% between 2010 and 2011. Almaguer said the CVB is working to create new airline connections to sixteen Canadian cities, which would represent an estimated 20% increase in tourism. “The Canadian market reported to us at Tianguis Turistico that there was a 25% increase in their tourism for this year, which is attractive based on the exchange rate between the peso and Canadian dollar and their strong economy,” he added. As for the European Market, the director of the CVB of Cancun mentioned that they met with Iberia and agreed on opening a direct flight between Madrid and Cancun, with the possibility of connecting Central America and the rest of Mexico, which will be further explored in the coming months. Almaguer Salazar also made a point to mention that he is in talks with Luftansa, with hopes of creating new flights between Cancun and Germany, in addition to the three weekly flights they currently manage with Air France, an airline that is in partnership with KLM and brings about 50 thousand Dutch tourists. For this reason, on April 11th, there will be meetings in Cancun to decide the flight schedules and to open offices in the country to encourage tourism. The director also mentioned that a Brazilian airline is interested in opening flights in the coming months to Cancun and that they are also concentrating on the two weekly flights that Aeroflot has, flying Moscow – Cancun – Mexico City – Moscow. Finally, he said that the he is confident that more tourism will be generated with the opening of more flights, as there are expectations to have direct connections from Las Vegas on Sun Country Airlines, as well as a promotional plan implemented on LMT tourism that integrates other major airlines. Added flights for the spring season to a variety of beaches and U.S. destinations. The plan will increase the fleet’s seat numbers in various routes and open new destinations. Mexico City,– Aeromexico, Mexico’s global airline, announces that beginning in April, it will operate new routes to and from various Mexican cities, in addition to an increase in seats and frequencies, thanks to the addition of new planes to its fleet. In support of its passengers, and as a way of thanking them for choosing Aeromexico, the airline will have special flights during the spring season. As of April 4th, the airline will begin operating daily flights between Guadalajara and Fresno, California and between Monterrey and Mexicali on a Boeing 737. There will also be daily flights between Guadalajara and Hermosillo, on an Embraer 145, and an overnight flight from Culiacan to Mexicali on an Embraer 190. Also beginning on the same date, routes between Mexico City and Mazatlan, Mexico City and Ciudad del Carmen, and Mexico City and Veracruz will be offering a greater passenger capacity, thanks to new planes that will be larger than the planes currently traveling those routes. There will also be additional flights between Hermosillo and Mexicali, Tijuana and Hermosillo, as well as Mexico City and Tapachula. As of May 9th, there will be an increase in the frequency of flights on several routes that are already running. Aeromexico will add another flight to the Mexico City – Campeche connection, the Monterrey – Veracruz connection, and two more flights between Mexico City and Oaxaca, which will amount to 40 connections a week to the city. To encourage passengers during the spring season and to satisfy the great demand during the holidays, Aeromexico is offering temporary special flight frequencies from 16th of April to the 1st of May. The temporary new flights will be to the following beach destinations, from Mexico City: Acapulco, Cancun, Puerto Vallarta, Los Cabos, and Zihuatanejo; and to the United States on routes such as Guadalajara – Los Angeles, Mexico City – San Antonio, and Mexico City – Miami. With this increase in routes and flight frequency, Aeromexico renews its commitment to further enhance the connectivity of the country for the benefit of all travelers and reinforces its position as the largest airline in Mexico. As of February, Aeromexico has a 43% market share within the domestic market, representing a 2% growth from the previous month; and a 21% market share within the international market, in conjunction with SkyTeam – according to figures from the Mexican Civil Aviation Authority. *To check schedules and availability of flights, please contact the Aeromexico call center, visit http://www.aeromexico.com/, or contact your travel agent. Jimm Budd’s News From D.F. Gloria Guevara, Minister of Tourism, confirmed on Tuesday that the Tianguis Turistico trade show no longer will be held in Acapulco, the venue since 1976. Among the reasons given are the importance of showing off what else Mexico has to offer. Not mentioned was the violence associated with gang wars, deterioration of meeting facilities, dwindling air service and more. Critics, for their part, argue that no other destination offers the same inventory of rooms or ease of transportation. The Tianguis now will “wander,” although just where it will be held in 2011 remains to be announced. Placido Domingo last night (Tuesday) presented a special concert in the city where he got his start. I received tickets as a birthday present. The tenor recalled how in 1959 he was a chorus boy in the production of Mi Bella Dama (My Fair Lady) at Bellas Artes (the Palace of Fine Arts). That is where I first heard him, in the company of the woman who became my wife. As an understudy, our hero on occasion sang “The Street Where You Live.” His director suggested that he try out for the local opera company. The rest, as they say, is history. One of the original five master-planned resort areas promoted by Fonatur (National Tourism Development Fund), Huatulco languishes. A group of bays on the Pacific, about 200 miles east (look at a map!) of Acapulco, by now Huatulco was supposed to have as many hotel rooms as Cancun. No way. Most of the original names (Sheraton, Crowne Plaza, Club Med) are gone and a promised re-launching might be said to have sunk. Angel Cruz, president of the local hotel association, and Alejando Zozoya, general director of AM Resorts, are among those expressing disappointment. Big need is a modern highway inland to Oaxaca, something that has been promised for years. Promises continue to be made. Nearly a two years after it suspended operations and sought bankruptcy law protection, Aviacsa intends to takeoff once again. Inaugural flight is set from Mexico City to Monterrey on May 2, but some charter flights me be approved before then. International service, however, will not be re-instituted until 2013. These announcements should be taken with the proverbial grain of salt. Mexicana gave several dates for its return to the air, but remains grounded. In Aviacsa, Roberto Madero has invested 4o million dollars and has plans to invest 20 million more. He hopes to sell stock to other investors. Aviacsa plans to start off with a fleet of just five planes that will operate 26 flights a day. Hospitality industry leaders thus far have made no comment about the weekend resignation of American Ambassador Carlos Pascual, but many no doubt are disquieted. Cooling diplomatic relations never are good for the travel industry. Pascual’s cables, sharply critical of the current administration, reportedly led President Felipe Calderón to request that the envoy be replaced. President Obama refused, but Pascual no doubt felt that he no longer would be able to function effectively, and resigned, apparently on Friday. 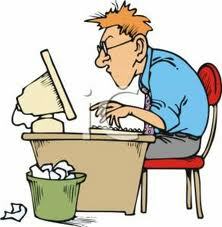 Big question is whether Obama will name a replacement of simply leave the post vacant as a sign of his displeasure. Environment plays an important part in whether American baby boomers will opt to buy a retirement home in Mexico, according to a study issued by the International Community Foundation, as reported in the newspaper Reforma. Environmental matters are being much discussed these days in light of stricter regulations protecting mangroves along the coasts. Mangroves are considered a defense against flooding and hurricane damage, but developers argue that the new regulations may cost the country hundreds of millions of dollars in investment. The Community Foundation, for its part, says that concern about over-building, inadequate trash collection and pollution prevention may discourage potential buyers from acquiring real estate in Mexico.